A story for every day of the year! "Where twenty-two children live and play and yell and shout and ride their tricycles and wagons and bikes and play with their dogs and cats and rabbits and turtles and monkeys and parrots - well, you can't just call a street like that Trufflescootems Boulebard, can you?" 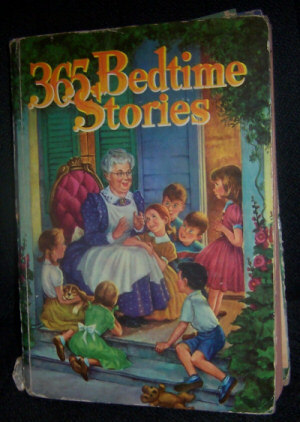 Many Baby Boomers were raised on Nan Gilbert's "365 Bedtime Stories." The book is a compilation of 365 tales ("The Sandstorm", "Party For The Pets", "Santa Claus Land", "Boy Or Girl", "The Black Blizzard", "A Day For Father", "Sport Wins A Fight", "Scratchy Spider and the Eight Cream Buns" etc.) about the children (Amy, Betty, Bob, David, Dorris, Ellen, Jack, Jane, Jerry, Kathy, Mary Lou, Mike, Paul, Peter, Pricilla, Ruth, Sally, Susan, Ted, Timmy, Toby & Polly) who live on the imaginary Trufflescootems Boulevard, nicknamed What-a-Jolly-Street. There's a map on the inner cover the book that shows the street and the locations of the School and the homes of the Nolens, Watsons, Carters, Lings, Mrs. Apricot, Johnsons, Browns, Barrets, Smiths and Mr. Gray's Store. As the subtitle of this page suggests, the book was arranged so that a new story could be read for every day of the year. Each page had a complete story, picture and the day's date. The book's wonderful illustrations are the work of Jill Elgrin. There are a few variations for this 1955 Whitman classic. The first two versions depict Mrs. Apricot reading to a group of seven children on a porch and to a group of six children (four on front cover, two on the back) in a living room. The latter version appears to be the most common. The 1970 cover shows a mother reading to two children in a bedroom. The 1981 edition, updated by Eileen Daly, depicts five children reading in a bed. The early versions, while currently in high demand, seem to be plentiful. There are consistently a half-dozen up for sale on popular auction sites.